Unless you run a business, chances are you do not really require the largest and most expensive chainsaw out there. 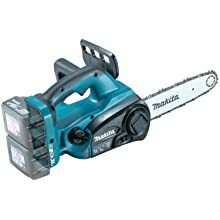 Instead, you might want to look for the best small chainsaw to buy on the market for residential purposes – trimming trees, clearing dead limbs or perhaps cutting a dead tree that has fallen after a storm. However, this segment has diversified lately, so there are plenty of choices. The more you know about them, the easier it becomes to make an informed decision. Furthermore, it is essential to do your homework and check some small chainsaw reviews before making a final choice. 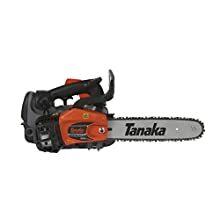 Tanaka TCS33EDTP/12 32.2cc 12-Inch Top Handle Chain Saw With Pure Fire Engine comes with a 12 inch top handle and chain, as well as a clean and efficient 32.2cc engine. The engine can easily compete with commercial grades alternatives in terms of fuel consumption and power. The machine starts instantly. It has its own automatic oiler, but also a side mechanism for chain tension adjustments. It is easy to access and it does not require any tools. You got full control over each operation. Plus, the small chainsaw is easy to maneuver due to the low vibrations and ergonomic handles. 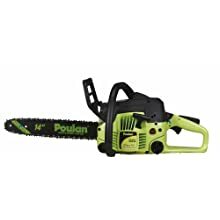 Poulan P3314 14-Inch 33cc 2-Cycle Gas-Powered Chain Saw has a 33cc two cycle engine. It operates with gasoline, yet it is quite clean and not as loud as you might expect. The cutting capacity goes up to 28 inches in diameter. The air filter system is cleaner than in other similar models. It oils by itself. As long as you keep the oil levels at the right standards, there are no reasons to worry about oiling. It starts in no time due to the primer bulb too, while the 14 inch steel bar makes the difference. If you live in California, you should know that this model is not CARB compliant. 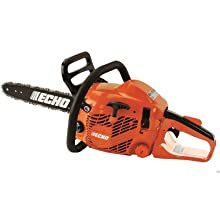 Echo CS-310 14″ Gas Chain Saw is known for the stability and comfort. Although it comes with a 30.5cc commercial grade two stroke engine, it does not vibrate too much. Starting and maneuvering the machine is a breeze, mostly because of the i-30TM starting system as well. The oiler is automatic and driven by a clutch. This small chainsaw does not just require less of it, but it also keeps itself maintained in the best possible shape. Chain adjustments are pretty handy as well due to the side access and no tool requirement. 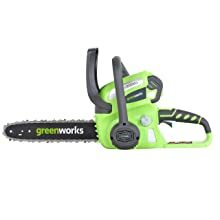 GreenWorks 20262 G-MAX 40V Li-Ion 12-Inch Cordless Chainsaw is battery operated, so you can forget about cords and messy gasoline. It comes with a G-MAX 40V li-ion system. Everything is included in the package – including the 2Ah battery. The 12 inch Oregon bar and chain can easily help you overcome all kinds of residential tasks – from limbing to cutting firewood. Chain tensioning does not require any tools while the automatic oiler makes maintenance pretty simple. You got both durability and a long lasting chain. Keeping an eye on the oil is pretty simple due to the translucent oil tank. You are less likely to forget about it. Black & Decker LCS1240 40-volt Cordless Chainsaw becomes an ideal choice if you need mobility and a clean environment. It works with a 40V MAX lithium ion battery, so it is cordless. Also, it does not release any emissions, like gasoline powered chainsaws. This small chainsaw has the most important features though – an automatic oiling system for self maintenance, as well as quick and simple chain tension adjustment. Making any adjustments does not require tools or experience. It has a 12 inch Oregon low kickback bar, as well as two ergonomic and comfortable handles. Vibrations are almost null while the lightweight profile – just 10.4 pounds – adds to the personal comfort and maneuverability. Makita XCU02Z 18V X2 LXT Lithium-Ion (36V) Cordless Chain Saw comes with a solid motor that delivers 1,650FPM. The cutting speed will surprise you, not to mention the power. After all, this small chainsaw requires two 18V LXT lithium-ion batteries. 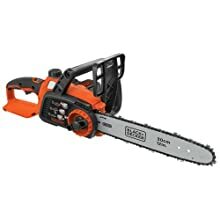 It can easily compete against more powerful chainsaws too. The noise level is relatively low for this segment – just 89dB. Your personal comfort will not be affected by it. The same rule applies to vibrations. The 12 inch bar contributes to the high capacity, while chain adjustments will only take a few seconds – easy access and no tools required. Remington RM1025SPS Ranger 10-Inch 8-Amp Electric Chainsaw is highly appreciated for the pole. Basically, this is a pole saw. The two parts can be detached though. The overall construction is more useful in tall trees and hardly accessible limbs. 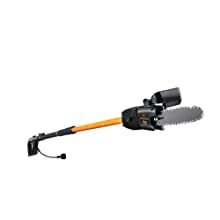 You can cut branches located 15 feet overhead with no issues at all. When it comes to close operations, you will not need the pole. The electric motor is quite powerful – 8amp. It works perfectly with the 10 inch bar and chain. The pole is installed with some lock clamps. It is easy to put in or out, but also secure. No tools are needed. The nonslip grip also makes the operation safer. Small chainsaws come with a plethora of benefits. They are mostly targeted at amateurs, hobbyists and random cutters who need specific operations around their homes. From this point of view, they are highly indicated to newbies with no experience. Safety risks are a lot lower, while results are just as spectacular. With time, they can also advance to more sophisticated machines. Given the size, they are also easier to maneuver. You do not have to keep the arms tensed, just like you will not really feel any discomfort or fatigue. The operation is effortless. The compact design reduces the weight as well. Plus, as long as they come with the right features, there is no need to get more power than what you need. Other than that, small chainsaws require less gas or electricity too, while batteries will guarantee for longer cutting sessions. As for vibrations, smaller engines come with less shaking. Once again, this is a matter of personal comfort. Unfortunately, nothing is perfect. Therefore, these small chainsaws might face a few problems as well. They obviously come with smaller engines, as well as less power. At some point, they may not be able to tackle more severe operations, such as cutting really thick trees from one move. Instead, you might need a few extra moves. Luckily, they can still get the job done pretty fast. Assess your needs before deciding. Write down what you will need this chainsaw for. Different jobs require different sizes and power standards. Whether it comes to gardening, limbing or just preparing some firewood, a small chainsaw can do a pretty good job. Think about the features you require too, as well as the bells and whistles that might be cool (yet not mandatory) to have. Bells and whistles add to the price. They look cool at a first glance, but they are not always useful, so you might waste your money. This consideration leads to another important one – the available budget. Small chainsaws do not cost a fortune, but their prices vary. Having a budget in mind will help you narrow the selections a little. Make sure that you do not sacrifice performance or you will spend money in vain. Apart from needs, safety standards and available budget, you should also consider the must-have features for these machines. An automatic chain oiler is a must because it makes maintenance easier and prevents accidents. A chain catcher is just as handy. If the chain jumps up, this feature will catch it before it hits the operator. Pay special attention to the chain brake too. It stops the small chainsaw if any sudden and abrupt movements are detected, not to mention problematic things to cut. The good news is that most of these features tend to become default in modern chainsaws. They are not general though, so it is still worth checking. A few other useful features include the case, wraparound front handle (prevents slipping), bucking spikes and chain adjustment. Chain adjustment is usually default too. Just look at the mechanism placement, so you can access it easily and handle it with no tools at all. As a short final conclusion, a small chainsaw is not as challenging as it might seem at a first glance. Doing your homework will lead to a more informed choice that you can actually take advantage of. This whole selection process should not take more than a few hours.